After performing the asyar afternoon prayers in a small mosque, Syahidin, 38, returned to his quarters and took his daughter from his wife, Senah, 30. He rocked his baby to sleep in the yard of the transmigration center in Mataram, West Nusa Tenggara, as his wife prepared food for breaking the fast. “This is our third daughter. Her name is Transiti Mariam Sudikah, named after the transit center where she was born,” Syahidin told The Jakarta Post. Transiti, born Aug. 13, is one of four children born at the Mataram transmigration center to parents of the Islamic sect Ahmadiyah. As many as 58 families from the sect, which follows the teachings of Mirza Ghulam Ahmad Qadiani, are taking refuge at the center. They were driven from their homes in Ketapang village in West Lombok in early February 2005 because the sect is considered heretical by Islamic authorities. This is their second Ramadhan at the center. Little has changed from last year. The atmosphere is relaxed as the Ahmadiyah followers go about their religious devotions. A group of men sat talking in the mosque, some looking after their children. In the communal kitchen, women prepared food to break the fast. Dozens of children played in the yard, but not too rough because they had all bathed and were neatly dressed. “This is our second Ramadhan as refugees. We have accepted our destiny. We are resigned to our fate and no longer demand anything (from the government). If the government wants us to be refugees for the rest of our lives, we’re ready,” said Syahidin. Food aid from the West Nusa Tenggara Social Welfare Office stopped in January this year. Sect members submitted a proposal for the resumption of assistance, but there has been no response from authorities. Group members are doing what they can to support themselves and their families. “Some of the household heads are doing construction or working as laborers, while others have set up small businesses. Housewives who are still strong sell vegetables at the market and some work as porters,” said another refugee, Suhaidi, 38. Suhaidi is working as a construction laborer to earn the money for the upcoming birth of his child. His wife is in the eighth month of pregnancy. The refugees may be able to cover their food expenses but not health and education costs. Most of them no longer have the identity cards necessary to qualify for medical cards or education assistance for their children. “Our Ketapang ID cards have expired and can no longer be extended. The Majeluk subdistrict administrative office refuses to provide us with ID cards on the grounds that we are refugees. Eventually, we have to pay for medical expenses,” said Suhaidi. Syahidin paid more than Rp 2 million (about US$220) for Transiti’s delivery at Mataram General Hospital. He was not allowed to bring Transiti home before settling the hospital bill. Of the 26 school-age children at the refugee center, five have been forced to drop out of high school because they can not afford the school fees. The children are also dealing with the trauma of seeing their homes in Ketapang torched. “I would prefer spending Ramadhan and Idul Fitri at our home in Ketapang, but I get scared whenever I remember our homes being burned down,” said third grader Sabhan. The call to the magrib dusk prayer echoes from Transito Mosque and the Ahmadiyah followers gather to break their fast – the men sitting in the mosque, the women and children on its porch. Teenagers hand out water and dates in plastic containers. “We have done everything we can, such as approaching the authorities, including sending a letter to the President, but to no avail. So now we urge followers to resign to their fate and sincerely accept the tests from God,” a member of the West Nusa Tenggara Ahmadiyah board of advisers, Maulana M. Saiful Ulum, told the Post. 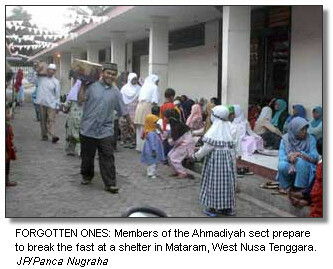 There are 88 Ahmadiyah families in West Nusa Tenggara, 55 of them living at the Mataram transmigration center, 15 at the former Praya Hospital on Lombok island and the rest scattered around the province.